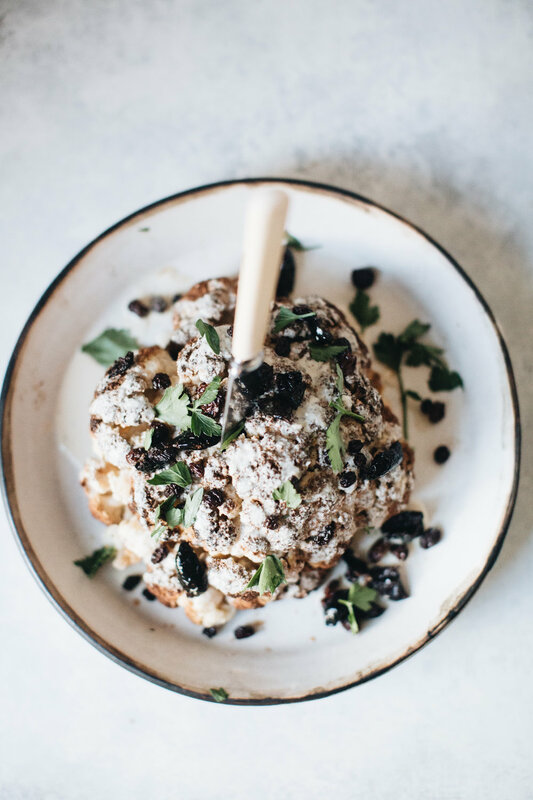 A whole head of cauliflower, roasted in its entirety, is a decadent dish. Roasting in this way leaves your cauli super tender and sweet, with a lovely ‘meaty’ texture. It’s also the perfect blank canvas for layering on flavour. I usually rub the cauliflower with some spices before roasting – think middle eastern spices like za’atar, harissa and shawarma for that hint of something special, or basic spices like smoked paprika and cumin also work well. Your cauliflower can simply be roasted in the oven, but I also like to smoke it for a much more intense flavour. It’s very simple to do – if you have a smoker grill, use that. If you don’t, you can use your conventional barbecue and add a pouch made of tinfoil, filled with smoking chips (easily found at hardware stores or online). Check out this youtube video which shows you how to make your own smoking pouch. Place the currants in a small bowl and pour over the vinegar. Allow to soak for at least 30 minutes, or overnight. Place the trimmed cauliflower head on a piece of foil and pour over the olive oil. Scatter with paprika, cumin and a huge pinch of sea salt and black pepper, and using your hands, massage the oil and spices into the cauliflower. If you are roasting in an oven, transfer the cauliflower and foil to a baking tray and place in hot oven. Roast for 60-90 minutes, until the cauliflower is tender all the way through. Test for readiness with a bamboo skewer or long knife. If the cauliflower becomes too dark while cooking, cover the top with foil. Alternately, heat a barbecue or smoker to the hottest setting. If you are smoking your cauliflower on a smoker grill, heat it for 10 minutes on the smoker setting. Once it starts to smoke, place the cauliflower and foil straight onto the grill and leave to cook for 2-3 hours. If you are using a conventional barbecue, place the smoking pouch (see introduction for instructions) straight onto your grill, and allow it to heat for 5 minutes. Once you see smoke coming out of the hole, place your cauliflower (on the foil) straight onto the grill. Reduce heat to medium, and allow to smoke and cook for 30 minutes. 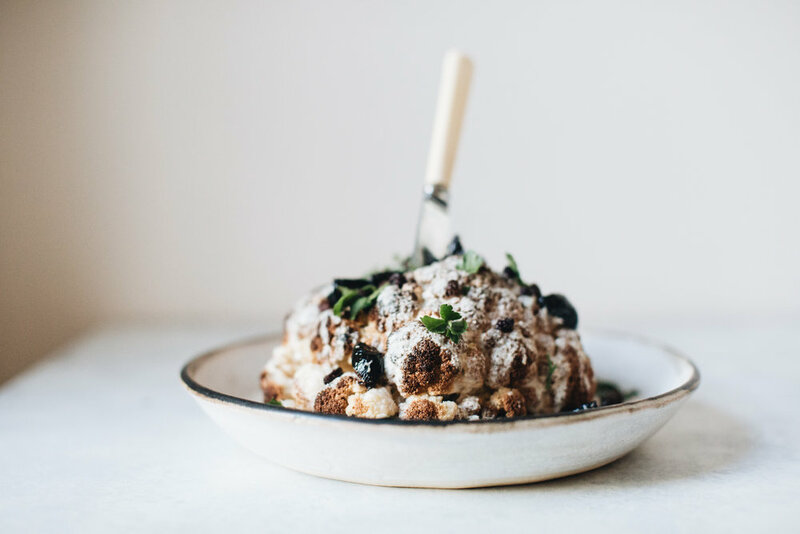 Check the underside of your cauliflower during cooking – if it starts to burn, reduce heat or add another layer or two of foil. Whisk together the tahini, lemon juice, olive oil, garlic, and salt until smooth and creamy. Add the water, a tablespoon at a time, and whisk until smooth. The sauce will become thick as you whisk – simply add more water and keep whisking until it is the consistency of thickened cream. To serve, place the cauliflower on a serving plate, and drizzle over the lemon tahini. Scatter over the balsamic soaked currants, olives and parsley. Serve with a serrated knife to carve at the table. Eat warm or at room temperature.